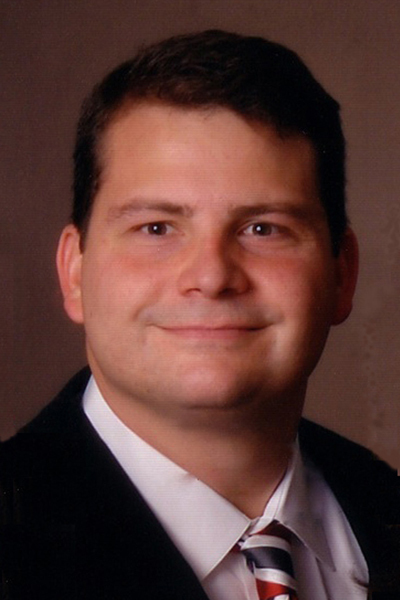 Home > Faculty > Foradori Chad D.
Dr. Foradori joined the Auburn University faculty in 2010. A native of Pennsylvania, Dr. Foradori received a B.S. degree from Muskingum University in New Concord, OH, and a PhD degree from the University of Cincinnati, College of Medicine. Dr. Foradori continued his training as a postdoctoral fellow at Colorado State University College of Veterinary Medicine and Biomedical Sciences. Before joining the faculty at Auburn, Dr. Foradori was a research assistant professor at the University of Arizona College of Medicine-Phoenix. My research focuses on the neuroendocrine control of reproduction. Specifically, what factors mediate the release of gonadotropin releasing hormone (GnRH) and the subsequent release of gonadotropins (luteinizing hormone and follicle stimulating hormone) from the anterior pituitary. GnRH regulation requires the translation of neural and hormonal inputs into a precisely regulated output to achieve normal sexual development and gonadal function. Changes in the pulsatile secretion of GnRH are critical for the regulation of events leading to ovulation, inhibition of ovulation prior to puberty and during other physiological periods of infertility. Despite the importance of GnRH neuronal activity in mammalian reproduction, little is known about the inputs controlling the coordination of GnRH neurons resulting in pulsatile and preovulatory release. The paucity of knowledge is due to the fact that GnRH neurons have a limited number of synaptic inputs and express a relatively small number of steroid receptors. One way to identify the underlying mechanisms involved in the normal control of GnRH neurons is to examine the system during periods of distress or after developmental insults. Therefore, my research examines the effects of environmental factors which may alter GnRH activation. In doing so, we will be better able to identify those factors essential for normal reproductive function and develop intervention strategies to protect against environmental factors that may perturb normal reproductive function. I am the course coordinator for VMED-5131 (Basic Microanatomy of Domestics Animals) and VBMS 7020 (Microscopic Anatomy I) and an instructor in VMED 5141 (Organology of Domestic Animals), VBMS 7030 (Microscopic Anatomy II) and VBMS 7070 (Endocrinology).